Above: Frances Robinson in a publicity still from the serial Tim Tyler’s Luck (Universal, 1937). Many female serial leads were distinguished more by their beauty and their pleasant screen personalities than by any outstanding acting abilities; Frances Robinson, however, was just as notable for thespian skill as she was for her considerable attractiveness. In her two chapterplays (both Universal outings), she not only played the leading lady with a wonderfully engaging balance of charm, intelligence, and spirit, but also individualized her heroines to an unusually strong extent, giving them varied touches of personality rarely found in the average serial ingénue. Frances Robinson was born Marian Frances Ladd at the New York military base of Fort Wadsworth; her father was a Massachusetts-born US Army sergeant, while her mother was an immigrant from England (as were both of her father’s parents). The 1920 census finds the Ladd family living in Maryland, but by 1921 Frances (and, presumably, her parents) had returned to New York–where the four-year-old girl made her screen debut in D. W. Griffith’s Orphans of the Storm, playing one of the titular heroines as a child. Her father died in 1925, and her mother moved the family out to California, where young Frances played child roles in a few more silent films during the late 1920s, before temporarily abandoning screen acting. The early 1930s found Frances working as an illustrator’s model; she also did some New York stage work before making her return to the movies in 1935. Using her real name, she played bits in films for several studios before signing with Universal in 1937–adopting “Frances Robinson” as her screen name in the process. Robinson’s first major Universal role came in the 1937 serial Tim Tyler’s Luck, a top-notch jungle adventure based on a popular comic strip. She was cast as heroine Lora Graham, whose brother Donald had been framed for a South African diamond robbery by notorious criminal “Spider” Webb (Norman Willis); using the alias of Lora Lacey and posing as a big-game huntress, she journeyed into the African jungle in search of Webb, hoping to force him to clear her brother. 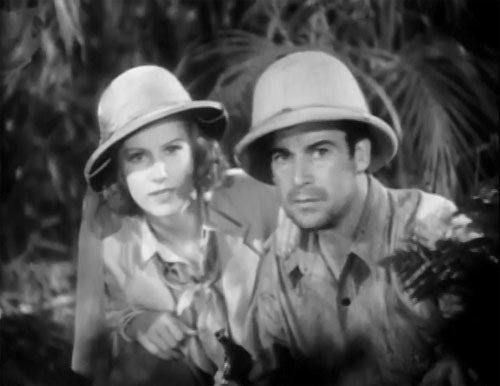 There, she encountered young Tim Tyler (Frankie Thomas), whose scientist father (Al Shean) had discovered the secret of the fabled Elephants’ Graveyard and was being threatened by the ivory-hungry Webb; together, Tim and Lora managed to bring down the ruthless Webb and his gang of jungle outlaws. Tim Tyler was one of Universal’s very best serials, combining as it did colorful fantasy with involving drama; strong characterizations also helped to make it something special–Frances’ multifaceted turn as Lora chief among them. She used a convincing British-colonial accent (her family background probably helped her here) to give her lines a ladylike but coolly self-assured tone, and lent her character an air of unshakable determination, making Lora seem almost relentlessly focused on her quest to save her brother. She was similarly convincing (and similarly excellent) when she adopted a cynically hard-boiled “adventuress” pose (part of an attempt to infilitrate Webb’s gang), when she genteelly and graciously interacted with various jungle officials (a riverboat captain, the officers of the “Ivory Patrol”), and when she warmly bestowed sisterly sympathy or encouragement on young hero Tim. Above: Frances Robinson sweetly tries to convince riverboat captain Al Bridge to let her pay the fare for disconsolate detected stowaway Frankie Thomas (back to camera) in Tim Tyler’s Luck (Universal, 1937). Above: Frances Robinson and Earl Douglas have spotted Spider Webb’s gang in Tim Tyler’s Luck. Robinson followed Tim Tyler with a co-starring role in the 1938 Universal Western drama Forbidden Valley, but then spent the rest of 1938 playing minor roles in Universal features. She did play one other major role that year, however–in Red Barry, another comic-strip-based Universal serial. This entertaining but disjointedly-plotted crime chapterplay was not as strong as Tyler–and also didn’t give Frances as central a role as she’d enjoyed in the earlier serial; that said, she still made a strong impression in Barry, turning in a memorably lively performance as a resourceful girl reporter called “Mississippi,” who assisted police-detective hero “Red” Barry (Buster Crabbe) in his investigation of a two-million-dollar bond robbery. Robinson played this part with a delightfully light touch, affecting a cute–but never overdone–Southern accent, and bringing an endearingly breezy and cheerful manner to her interactions with Crabbe’s Barry and Wade Boteler’s Inspector Scott; her sweetly impudent baiting of an antagonistic police commissioner (William Gould) was also highly enjoyable. However, humorous though Frances’ Barry performance often was, she never came off as thoughtless or scatterbrained; she easily switched from breeziness to quiet alertness whenever she got a chance to assist Crabbe and Boteler in their detective work, and made her character seem as shrewd and capable as she was folksy and casual. 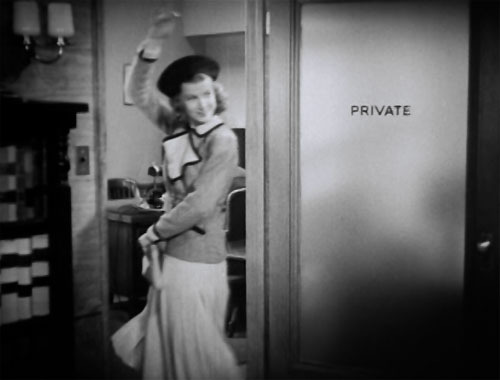 Above: Frances Robinson makes a cavalier exit from the Police Commissioner’s office in Red Barry (Universal, 1938), after impishly informing the irate official of her next headline (“Red Barry recovers bonds in spite of Commissioner’s assistance”). Above: Frances Robinson has just finished eavesdropping on suspect Edna Sedgwick’s phone conversation in Red Barry. 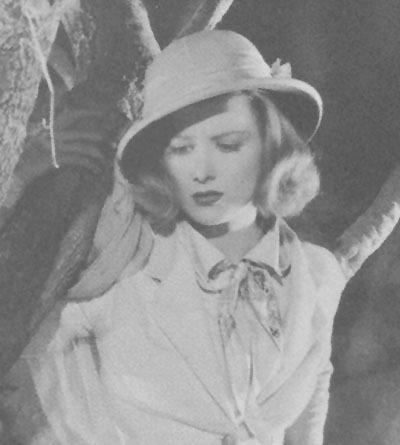 Robinson appeared frequently (occasionally as leading lady, more frequently as a backup player) in Universal’s B-westerns and B-mysteries during 1939 and 1940; during the latter year, she left Universal to freelance and met with some success–landing co-starring roles in several 1940-1941 Columbia B-features, and then advancing to MGM, where she played noticeable supporting roles in the 1941 films Dr. Jekyll and Mr. Hyde and Smilin’ Through. She also did some radio work during the early 1940s, making multiple appearances on The Lux Radio Theatre and Manhunt. Frances continued to appear on radio after the outbreak of World War 2, but almost entirely halted her film career during the war years, in order to take a job in the personnel-placement department of the Lockheed aircraft factory. In 1946 she started making movies again–but only on a sporadic basis; the second half of the 1940s found her devoting most of her time to radio and stage appearances, and to a job in advertising; when not otherwise occupied, she took occasional supporting roles in feature films. Robinson continued her active radio career during the 1950s, worked for a time as a spokeswoman for Arrid Deodorant, and also made regular television appearances– principally guest spots on anthology shows, although she did play a recurring role as a next-door neighbor on the 1957-1958 sitcom Mr. Adams and Eve. She kept working on television throughout the 1960s, while making occasional returns to the big screen as a character actress; however, her movie and TV appearances dwindled considerably as the decade wore on–possibly as a result of ill health, since (sadly) she was still comparatively young when she passed away in Los Angeles, in the summer of 1971. Frances Robinson’s two chapterplay characters were both stock serial figures, the Girl Seeking To Clear Her Relative’s Name and the Spunky Girl Reporter–but she played the former part with such vigorous conviction, and the latter one with such quirky and sure-handed humorousness, that her characters came off as well-rounded (and appealing) personalities, not mere “types.” She may not have been one of the serial genre’s most prolific heroines, but she was definitely one of its best and most interesting actresses. Above: Frances Robinson in Red Barry (Universal, 1938). Acknowledgements: Google’s newspaper archives yielded a wealth of old news items concerning Frances Robinson (so many, in fact, that they can’t be briefly listed by their full titles here); from them, I gleaned information about her Lockheed stint, her advertising job, her modeling, her childhood acting, her role on Mr. Adams and Eve, and her New York acting background. The federal censuses were also great helps, as were Robinson’s long list of credits at the Radio Gold Index site and the entries for her father, her mother, and herself at the Find A Grave site; Ed Hulse, of Murania Press, gave me useful additional info, and so did a short Western Clippings/Serial Report blurb on Robinson.